A wonderful family home! Set along one of Chew Stoke's premier roads this detached, five bedroom, property benefits from having had just one owner since new. As a result the home comes to the market boasting spacious and flexible accommodation that is immaculately presented throughout. EPC rating C. DESCRIPTION A wonderful family home! Set along one of Chew Stoke's premier roads this detached, five bedroom, property benefits from having had just one careful owner since new. As a result the home comes to the market boasting spacious and flexible accommodation that is immaculately presented throughout. The position of the property is particularly impressive, sat elevated, the property offers pleasant views over the village and countryside beyond but also offers outstanding schools literally on the doorstep as well as being within very easy commuting distance of Bristol, Bath and Wells! Sunnyside, built in the 1990's, is entered at the front into a large traditional hallway. The downstairs is vast and adopts a flow that is bound to suit a growing family! Reception rooms include the beautiful sitting room with feature 'Chesney' stone fireplace and inset log burner, a large dining room with wonderful oak flooring and double doors leading to the gardens. The ground floor also benefits from a good sized study and separate useful WC. The stand out room though is the superb 'Harvey Jones' kitchen which is found at the back of the property. 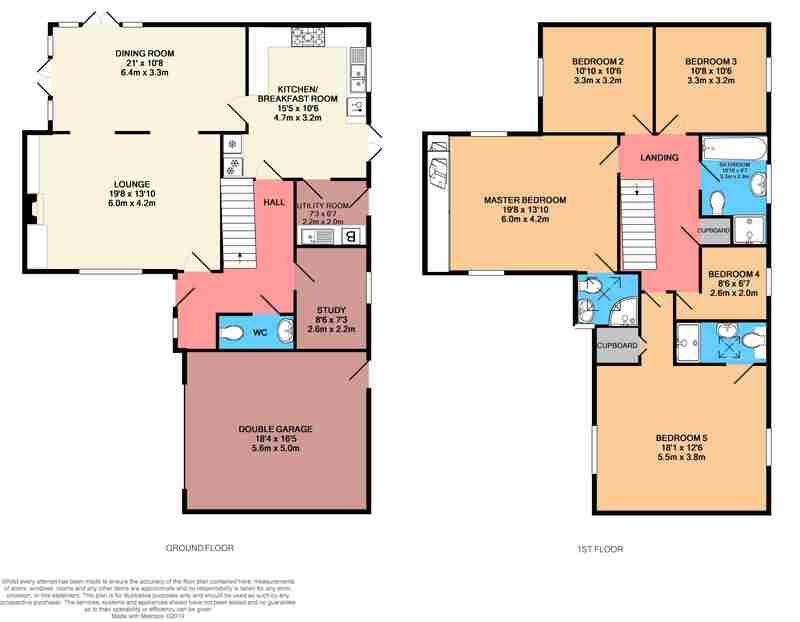 The kitchen is of a great size offering ample fitted unit space, a fitted 'Britannia' range cooked as well as room for a good sized dining table, double doors leading to the rear garden make this a wonderful room all year around. A sperate utility room can also be found next door to the kitchen and also provides access to the gardens. The first floor is equally as good! Five, light and airy, bedrooms all flow from a large landing and each enjoy their own unique outlook over the property's gardens and village beyond. The master bedroom is of a brilliant size and benefits from its own ensuite shower room, as does the second bedroom which was added by the current vendors over the garage! The further three bedrooms upon this floor are all serviced by a modern four piece family bathroom. The gardens at Sunnyside run predominantly to the rear of the property. Whilst the majority of the level gardens are laid to lawn there is also a wonderful array of mature flower and shrub boarders which also house an abundance of fruit trees. To one end of the rear, south facing garden there is a raised patio area, just perfect for entertaining! To the other side of the property there is a further raised seating area and a series of box hedges that hide a small feature pond. To the front of the property there is ample off street car parking for multiple vehicles as well as access into the property's double garage. SITUATION The village of Chew Stoke is one of the most sought after villages in the lovely Chew Valley, surrounded by glorious green belt countryside and within a walk of Chew Valley Lake. The Bath & North East Somerset village has a population of around 900 and has its own village restaurant, doctor surgery and pub! More comprehensive shopping, social and recreational facilities are available in nearby Chew Magna. There is a nursery, primary school and secondary school all within walking distance. Bristol is within easy daily commuting distance to the north, where there are a range of independent schools, access to the national motorway network and mainline railway links. Bristol International Airport is also with easy reach for the long distance traveller.